The WRS-1060-S iPhone Holder fits with 2 knobs securely on the WideRS' accessories. 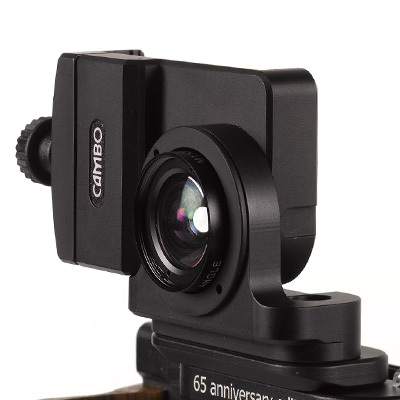 The Cambo iPhone Holder is compatible with the iPhone 4/4s and 5/5s. To use the functionality as viewfinder and composing tool, the use of the Viewfinder (Pro or eFinder) app is required, see this link to Direstudio.com. This app can be downloaded from the App Store. The WRS-1060-S pivots easily from Landscape to Portrait position and back. 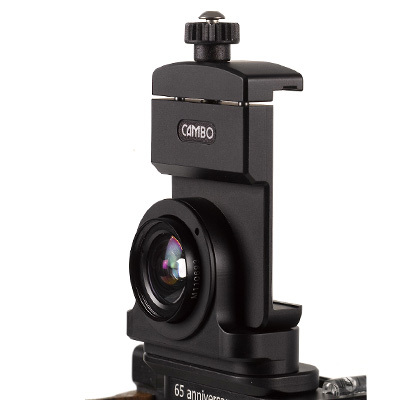 The front includes the Schneider iPro wide angle adapter lens, dedicated for the iPhone. Mounting the WRS-1060-S to any camera body with a hot shoe requires the WRS-1095 Hot Shoe Adapter. Note: Wide Angle Lens Schneider iPro is only included in the WRS-1060-S version.